While the nationwide truck driver shortage has led many to consider this growing career field, many are still curious about what kind of salary this job comes with. While many factors go in to determining an exact salary, the Bureau of Labor Statistics (BLS) reports that truck drivers earn a median annual wage of $42,480. Once you have completed truck driving school and have a CDL in hand, your driving career could have you earning anywhere from $27,510 all the way up to $64,000 per year, according to the BLS. So, what goes into a truck driving salary? Read on for our comprehensive guide to what to expect, salary-wise, from a career in trucking. Trucking companies may also give bonuses and other perks/incentives to their top drivers. As you might expect, truck driver salary increases with years of experience. Truckers with specialized skills or training, and those who hold multiple endorsements, also have the potential to earn more. 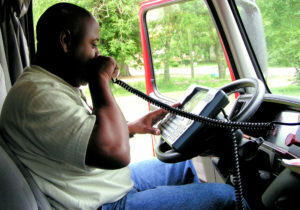 Experienced truck drivers may also decide to become self-employed or start their own trucking businesses. According to Payscale, entry-level truck drivers earn a median wage of $17.64 per hour, while experienced truck drivers earn a median hourly wage of $19.23, not including bonuses or profit-sharing proceeds. Some truck drivers prefer to work in teams. This means that two drivers will travel together, splitting the driving duties (typically one will drive while the other sleeps, and vice versa…this is a popular arrangement for married couples). Teams are usually offered split pay, meaning that the per mile rate is split between the two drivers. For example, if the per mile rate for the truck is $0.50, each driver would earn $0.25 per mile. Split pay is something that should be considered before deciding to work as a team, though some teams enjoy the arrangement due to being able to get their load to its destination faster with two drivers at the ready, letting them get back on the road with another load more quickly.